Portuguese Guinea (as well as the nearby Cape Verde archipelago) had been claimed by Portugal since 1446 and was a major trading post for commodities and African slaves during the 18th century, before the former had been outlawed by the Portuguese authorities. The interior was however not fully controlled by the Portuguese until the latter half of the 19th century. Sporadic fighting continued during the early 20th century and the Bijagós Islands were not pacified under Portuguese rule until 1936. The Portuguese Guinea was dependent from the government of Cape Verde until 1887, when it gained the status of a separate overseas province of Portugal. In 1892, it received the status of autonomous district, becoming again a province in 1896. In the beginning of the 20th century, the Portuguese Guinea started to be referred to as "colony", despite still having the generic status of overseas province. With the effectiveness of the Portuguese Colonial Act of 1930, the designation "colony" fully replaced that of "province". In 1952, by a constitutional amendment, Portuguese Guinea became again referred as an overseas province, losing the status of "colony" . While there had always been local resistance it was not until 1956 the first liberation movement was founded by Amílcar Cabral and Rafael Barbosa, the African Party for the Independence of Guinea and Cape Verde (PAIGC). The first major activity of the PAIGC was a strike by dock-workers in Bissau on August 3, 1959. The colonial police violently repressed the strike and more than 50 people died, the incident became known as the Pijiguiti Massacre. The massacre led to a major upswing of popular support for the PAIGC. By 1960, it was decided to move headquarters to Conakry in neighboring Republic of Guinea (former French Guinea) in order to prepare for an armed struggle. On April 18, 1961 PAIGC together with FRELIMO of Mozambique, MPLA of Angola and MLSTP of São Tomé and Príncipe formed the Conference of Nationalist Organizations of the Portuguese Colonies (CONCP) during a conference in Morocco. The main goal of the organization was cooperation of the different national liberation movement in Portuguese colonies. The war in Guinea has been termed "Portugal's Vietnam". The main indigenous revolutionary insurgent movement, the Marxist African Party for the Independence of Guinea and Cape Verde or PAIGC was well-trained, well-led, and equipped and received substantial support from safe havens in neighbouring countries like Senegal and Guinea-Conakry. The jungles of Guinea and the proximity of the PAIGC's allies near the border proved to be of significant advantage in providing tactical superiority during cross-border attacks and resupply missions for the guerrillas. In 1961 PAIGC commenced sabotage operations in Guinea-Bissau. At the start of hostilities the Portuguese had only two infantry companies in Guinea Bissau and these concentrated in the main towns giving the insurgents free rein in the countryside. The PAIGC blew up bridges, cut telegraph lines, destroyed sections of the highways, established arms caches and hideouts, and destroyed Fula villages and minor administrative posts. In late 1962 the Portuguese launched an offensive and evicted the PAIGC cadres that had not integrated with the local population. 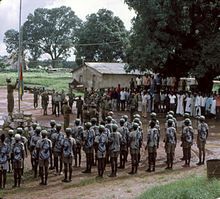 Open hostilities broke out in January 1963 when guerrillas from the PAIGC attacked the Portuguese garrison in Tite, near the Corubal River, south of Bissau, the capital of Portuguese Guinea. Similar guerrilla actions quickly spread across the colony, mainly in the south. The geography, dense forests with numerous waterways, were favourable to guerrilla activity. The PAIGC had few weapons – perhaps only one submachine gun and two pistols per group – so attacked Portuguese convoys to gain more weapons. Each group fought in isolation and established a forest based independently from the others. Many groups were formed on tribal and religious grounds. These groups began to abuse the locals and people began to flee the “liberated” zones. The central PAIGC command were horrified and considered this military “commandism”. Around Oct 1963 the Portuguese began to retaliate against PAIGC activity with bomber raids; by the end of 1963 some villages had been abandoned as the occupants took to the forest. In 1964 PAIGC opened their second front in the north. In April 1964 the Portuguese launched a counter-offensive. They attacked the PAIGC held island of Como in the south of the country. 3,000 Portuguese, with air support, were involved but after 65 days were forced to withdraw. The PAIGC harassed the Portuguese during the rainy season. At some point in 1964 Portuguese Air Force planners failed to verify their target and bombed Portuguese troops. In retaliation Portuguese soldiers and sailors attacked the squadron barracks in the colony's capital Bissau. In 1965 the war spread to the eastern part of the country; that same year the PAIGC expanded its attacks in the northern area of the country, where at the time only the Front for the Liberation and Independence of Guinea (FLING), a minor insurgent force, was operating. By this time, the PAIGC, led by Amílcar Cabral, began openly receiving military support from the Soviet Union, China, and Cuba. The success of PAIGC guerilla operations forced the Exército Português do Ultramar (Portuguese overseas armed forces) deployed in Portuguese Guinea on the defensive at an early stage; the latter were forced to limit their response to defending territories and cities already held. Unlike Portugal's other African territories, successful small-unit Portuguese counterinsurgency tactics were slow to evolve in Guinea. Defensive operations, where soldiers were dispersed in small numbers to guard critical buildings, farms, or infrastructure were particularly devastating to the regular Portuguese infantry, who became vulnerable to guerrilla attacks outside of populated areas by the forces of the PAIGC. They were also demoralized by the steady growth of PAIGC liberation sympathizers and recruits among the rural population. In a relatively short time, the PAIGC had succeeded in reducing Portuguese military and administrative control of the country to a relatively small area of Guinea. The scale of this success can be seen in the fact that native Guineans in the 'liberated territories' ceased payment of debts to Portuguese landowners as well as payment of taxes to the colonial administration. The branch stores of the Companhia União Fabril (CUF), Mario Lima Whanon, and Manuel Pinto Brandão companies were seized and inventoried by the PAIGC in the areas they controlled, while the use of Portuguese currency in the areas under guerilla control was banned. In order to maintain the economy in the liberated territories, the PAIGC was impelled at an early stage to establish its own Marxist administrative and governmental bureaucracy, which organized agricultural production, educated farm workers on protecting crops from destruction from government attacks, and opened collective armazéns do povo (people's stores) to supply urgently needed tools and supplies in exchange for agricultural produce. By 1967 the PAIGC had carried out 147 attacks on Portuguese barracks and army encampments, and effectively controlled 2/3 of Portuguese Guinea. The next year, Portugal began a new campaign against the guerrillas with the arrival of the new governor of the colony, General António de Spínola. General Spínola instituted a series of civil and military reforms, intended to first contain, then roll back the PAIGC and its control of much of the rural portion of Portuguese Guinea. This included a 'hearts and minds' propaganda campaign designed to win the trust of the indigenous population, an effort to eliminate some of the discriminatory practices against native Guineans, a massive construction campaign for public works including new schools, hospitals, improved telecommunications and road networks, and a large increase in recruitment of native Guineans into the Portuguese armed forces serving in Guinea as part of an Africanisation strategy. The Portuguese conducted many search and destroy operation against the PAIGC 20 km from the frontier. On one occasion five helicopters landed 50 white plus some African soldiers. 36 FARP[who?] men under Bobo, commander of the Sambuya zone, drew the Portuguese forces into a wooded area. Bobo launched an ambush 1700 hours, inflicted casualties, and forced the Portuguese to withdraw. The PAIGC claimed the Portuguese suffered five dead and several wounded against their own four wounded. In 1966 the Portuguese attempted four large unsuccessful search-and-destroy sweeps of Iracunda. Each included several hundred conscripts with automatic weapons, mortars, bazookas, and air support. Warned by the peasants or by their own reconnaissance patrols the PAIGC pulled back, loosely encircled the Portuguese, and launched night attacks to break up the column. The insurgents would sometimes feint at the end of the line to distract attention from the main attack elsewhere. The PAIGC considered the conscripts inept in the jungle. In Mar 1968 the PAIGC conducted an attack against the main Portuguese airfield just outside Bissau. The airfield was protected by wire, minefields and blockhouses. 13 volunteers infiltrated to the edge of the field and fired into the base, damaging planes on the ground, hangars, and other installations. They then withdrew with no casualties. The Portuguese stationed an infantry company at Madina do Boe in the east near the border with the Republic of Guinea. With few inhabitants and structures to protect, and a long permeable frontier to guard, the company ended up just protecting themselves. Despite the fact there was no real benefit to keep them there the authorities refused to withdraw the unit until 1969. As feared the PAIGC used the withdrawal as a PR opportunity with foreign journalists. In mid-1969 the PAIGC launched Operation Tenaz against Portuguese positions around Bafata, north of the River Corubal. They started by secretly depositing ammunition in dumps to the rear of areas of engagement. Reconnaissance was provided by two bi-groups that infiltrated the area to discover the Portuguese dispositions. Then two strike forces of several hundred men entered the area. Until 1960, Portuguese military forces serving in Guinea were composed of units led by white officers, with commissioned soldiers (whites), overseas soldiers (African assimilados), and native or indigenous Africans (indigenato) serving in the enlisted ranks. These discriminatory colour bars to service were eliminated as part of the Africanization policy of General Spínola, which called for the integration of indigenous Guinea Africans into Portuguese military forces in Africa. Two special indigenous African counterinsurgency detachments were formed by the Portuguese Armed Forces. The first of these was the African Commandos (Comandos Africanos), consisting of a battalion of commandos composed entirely of black soldiers (including the officers). The second was the African Special Marines (Fuzileiros Especiais Africanos), Marine units entirely composed of black soldiers. The African Special Marines supplemented other Portuguese elite units conducting amphibious operations in the riverine areas of Guinea in an attempt to interdict and destroy guerrilla forces and supplies. General Spínola's Africanization policy also fostered a large increase in indigenous recruitment into the armed forces, culminating in the establishment of all-black military formations such as the Black Militias (Milícias negras) commanded by Major Carlos Fabião. By the early 1970s, an increasing percentage of Guineans were serving as noncommissioned or commissioned officers in Portuguese military forces in Africa, including such higher-ranking officers as Captain (later Lt. Colonel) Marcelino da Mata, a black Portuguese citizen born of Guinean parents who rose from a first sergeant in a road engineering unit to a commander in the Comandos Africanos. Military tactical reforms by Portuguese commanders included new naval amphibious operations to overcome some of the mobility problems inherent in the underdeveloped and marshy areas of the country. These new operations utilized Destacamentos de Fuzileiros Especiais (DFE) (special marine assault detachments) as strike forces. The Fuzileiros Especiais were lightly equipped with folding-stock m/961 (G3) rifles, 37mm rocket launchers, and light machine guns such as the Heckler & Koch HK21 to enhance their mobility in the difficult, swampy terrain. Between 1968 and 1972, the Portuguese forces increased their offensive posture, in the form of raids into PAIGC-controlled territory. At this time Portuguese forces also adopted unorthodox means of countering the insurgents, including attacks on the political structure of the nationalist movement. This strategy culminated in the assassination of Amílcar Cabral in January 1973. Nonetheless, the PAIGC continued to increase its strength, and began to heavily press Portuguese defense forces. Portuguese Fiat G.91 fighter-bomber. During the War, the Portuguese Air Force employed the G.91 in the theatres of Guinea and Mozambique. In 1970 the Portuguese Air Force (FAP) began to use similar weapons to those the US was using in the Vietnam War: napalm and defoliants in order to find the insurgents or at least deny them the cover and concealment needed for rebel ambushes. In an effort to hamper assistance to the PAIGC from the neighboring Republic of Guinea, Portugal commenced Operação Mar Verde or Operation Green Sea on 22 November 1970 in an attempt to overthrow Ahmed Sékou Touré, the leader of the Republic of Guinea and staunch PAIGC ally, and cut off supply lines to PAIGC insurgents. The operation involved a daring raid on Conakry, a PAIGC safe haven, in which 220 Portuguese Fuzileiros (amphibious assault troops) and 200 Guinean anti-Ahmed Sékou Touré insurgents attacked the city. The attempted coup d'état failed, though the Portuguese managed to destroy several PAIGC ships and air force assets and freed all the 26 Portuguese POWs. One immediate result of Operation Green Sea was an escalation in the conflict, with countries such as Algeria and Nigeria now offering support to the PAIGC as well as the Soviet Union, which sent warships to the region (known by NATO as the West Africa Patrol) in a show of force calculated to deter future Portuguese amphibious attacks on the territory of the Republic of Guinea. The United Nations passed several resolutions condemning all the Portuguese cross-border attacks in Guinea, like the United Nations Security Council Resolution 290 and United Nations Security Council Resolution 295. In general, the PAIGC in Guinea was the best armed, trained, and led of all the guerrilla movements. After 1968 PAIGC forces were increasingly supplied with modern Soviet weapons and equipment, most notably SA-7 rocket launchers, radar-controlled AA cannon, and even jet aircraft in the form of several Ilyushin Il-14 bombers. These weapons effectively undermined Portuguese air superiority, preventing the destruction by air of PAIGC encampments in territory it controlled. By 1970 the PAIGC even had candidates training in the Soviet Union, learning to fly MIGs and to operate Soviet-supplied amphibious assault crafts and APCs. As part of the efforts to undermine the organizational structure of PAIGC, Portugal had tried to capture Amílcar Cabral for several years. After the failure of capturing him in 1970 during Operation Green Sea the Portuguese started using agents within the PAIGC to remove Cabral. 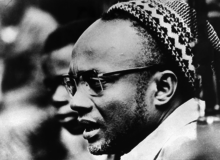 Together with a disgruntled former associate, agents assassinated Amílcar Cabral on the 20th January 1973 in Conakry, Guinea. The assassination happened less than 15 months before end of hostilities. On April 25, 1974 the Carnation Revolution, a left-wing military led revolution, broke out in Portugal ending the authoritarian dictatorship of Estado Novo. The new regime quickly ordered cease-fire and began negotiating with leaders of the PAIGC. On 26 August 1974, after a series of diplomatic meetings, Portugal and the PAIGC signed an accord in Algiers, Algeria in which Portugal agreed to remove all troops by the end of October and to officially recognize the Republic of Guinea-Bissau government controlled by the PAIGC. Portugal granted full independence to Guinea-Bissau on September 10, 1974, after 11 1/2 years of armed conflict. With the coming of independence, the PAIGC moved swiftly to extend its control throughout the country. The PAIGC had already unilaterally proclaimed the country's independence a year before in the village of Madina do Boé, an event that had been recognized by many socialist and non-aligned member states of the United Nations. A one-party state controlled by the PAIGC and headed by Luís Cabral, half-brother of Amílcar Cabral was established. Being given the choice of either to go back home with their families and belongings, and full payment till the end of December that year, or to join the PAIGC military, a total of 7,447 black African soldiers who had served in Portuguese native commando units, security forces, and the armed militia decided not to join the new ruling party and were summarily executed by the PAIGC after Portuguese forces ceased hostilities. Cuba: Havana's Military Machine, the Atlantic, August 1988. "In Guinea-Bissau, Cuban combat units saw action, fighting with Amilcar Cabral's rebel army against Portuguese colonial rule." The Cuban Intervention in Angola, 1965-1991: From Che Guevara to Cuito Cuanavale, 2005. Page 354. ^ Guerrilla Warfare: A Historical and Critical Study, 1976. Page 362. ^ Revolution and Chinese Foreign Policy: Peking's Support for Wars of National Liberation Peter van Ness, 1971. Page 143. ^ Cuba in the World, 1979. Page 95-96. ^ Amilcar Cabral: Revolutionary Leadership and People's War, 2002. Page 86. ^ Guerrilla Strategies: An Historical Anthology from the Long March to Afghanistan, 1982. Page 208. ^ Qaddafi: his ideology in theory and practice, 1986. Page 140. ^ Modern African Wars: Angola and Moçambique 1961-1974, 1988. Page 12. ^ Wars in the Third World since 1945, 1995. Page 35. ^ Elizabeth Buettner (24 March 2016). Europe after Empire: Decolonization, Society, and Culture. Cambridge University Press. pp. 204–. ISBN 978-0-521-11386-1. ^ PAIGC, Jornal Nô Pintcha, 29 November 1980: In a statement in the party newspaper Nô Pintcha (In the Vanguard), a spokesman for the PAIGC revealed that many of the ex-Portuguese indigenous African soldiers that were executed after cessation of hostilities were buried in unmarked collective graves in the woods of Cumerá, Portogole, and Mansabá.